VP of Cisco’s Emerging Technologies Group talks about creating successful businesses from nascent ideas. 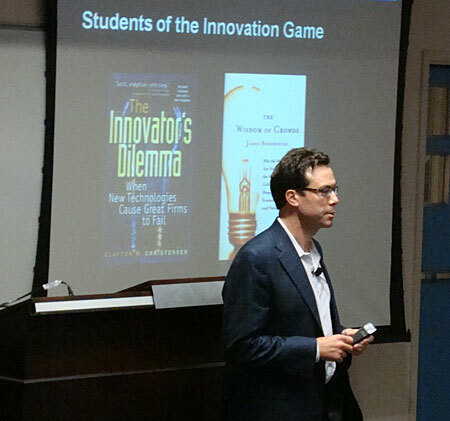 Didier Moretti, VP of the Emerging Technologies Group at Cisco, outlines strategies for business innovation. From left: Dr. Walid Touma, director of LAU's University Enterprise Office, Didier Moretti and George Akiki, director of Cisco Corporate Affairs in the Middle East and North Africa, discuss Lebanon's venture capital needs. 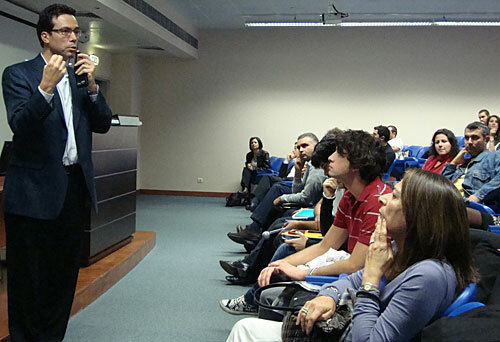 Moretti emphasizes the importance of entrepreneurship to a captive audience. 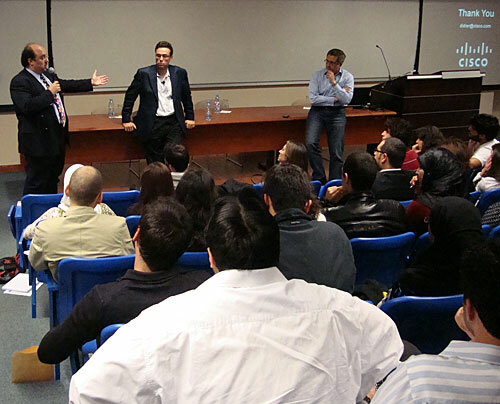 Marking another chapter in their flourishing relationship, LAU and the IT giant Cisco organized a lecture given by Didier Moretti, vice president of the Emerging Technologies Group at Cisco, on December 2 in the Business Building, Beirut campus. Entitled “Innovation@Cisco,” the event tackled how the concept of business incubation at Cisco is being undertaken by the company’s four-year-old Emerging Technologies Group. 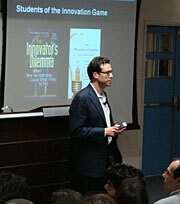 It was co-hosted by the university’s schools of Business and Engineering. The term “innovating incubation” in business and technology, as explained in Cisco’s website, refers to the process of providing a favorable environment for nascent ideas to morph into business units — and then nurturing these small, newly established businesses toward full development. Moretti outlined how his team at Cisco is currently working toward the ambitious goal of creating “a stream of billion-dollar businesses”; businesses valued at $1 billion within five to seven years of launching. Notable examples of successful ideas that, through incubation, have boomed into businesses worth billions are the TelePresence audio-video system and FlipVideo hand-held digital camcorder and video-sharing devices. Both Moretti and Touma were enthusiastic about the potential of such innovation ventures for Lebanon, especially considering the country’s heritage in creative businesses. However, they identified three main obstacles that impeded progress in this area — the small number of entrepreneurs, outdated legislation and a lack of infrastructure, particularly broadband. “There is no shortage of capital in Lebanon,” said Touma — “there is a shortage of people, of laws and of infrastructure for mitigating the risks.” He added that the government needs to partner with corporations and the financial sector in order to make investment in innovation possible. Directors of leading Lebanese banks, NGOs, local entrepreneurs, and students, faculty and staff from other Lebanese universities were invited to the event. The speakers encouraged the audience to sign the Broadband Manifesto — that is also supported by LAU — which is an effort by the Lebanese Broadband Stakeholders Group to mobilize support for widespread broadband access in Lebanon as a basic necessity for any economy. The speakers also made an effort to inspire students to take the plunge into entrepreneurial life. “There is nothing magical about being an entrepreneur,” claimed Moretti, adding that while going into business is indeed a risk, young people should not be afraid to act on their ideas, because they have comparatively less to lose. Read more about LAU’s cooperation with Cisco.